Top: Herbig Haro 111, a “jetted star” sporting a filamentary jet 12 light-years in length. 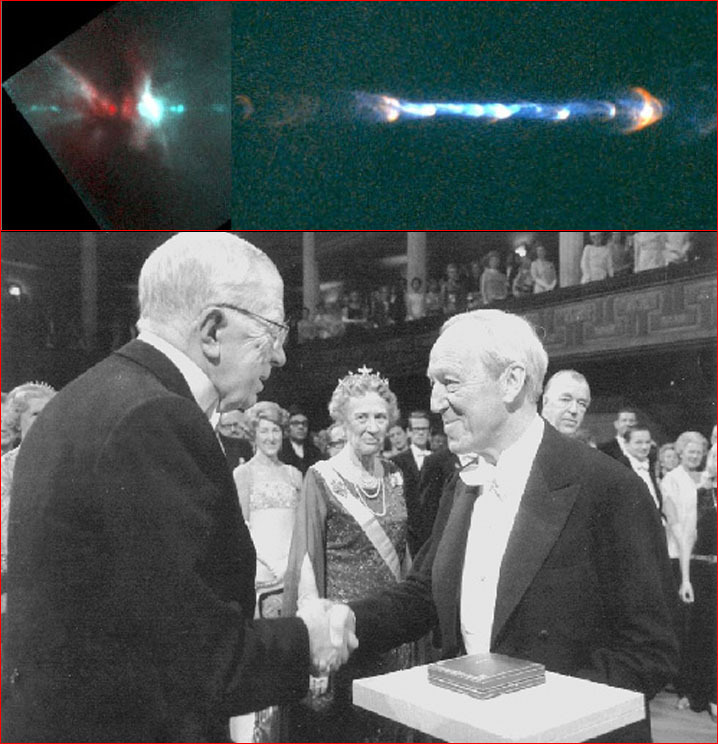 Bottom: Hannes Alfvén, the father of modern plasma science, receiving his Nobel Prize from the King of Sweden in 1970.
Credit: Bo Reipurth CASA/U. Colorado) et al., HST, NASA. In the twentieth century, astronomers showed only a limited appreciation of plasma phenomena. 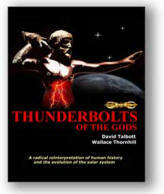 Most ignored the role of electric currents in space plasma, a subject unfamiliar to them. As a result, the cascade of more recent observations has left astronomers grasping for explanations. In our previous Picture of the Day we noted the mystery of Herbig Haro 49/50, conventionally described as a star-born “cosmic tornado” exhibiting attributes that are, in astronomers’ words, “poorly understood”. Attempts to explain the jets using standard astronomical models have consistently failed to give plausible answers. What force is capable of producing high-energy jets spanning light-years? And by what means are these jets confined to a narrow stream across such distances? Jetting stars, now observed by the hundreds, find no comfortable place in the lexicon of traditional astronomy. The only known force that can prevent a stream of gas from rapidly dispersing in the vacuum of space is magnetism, and only electric currents can generate a magnetic field. But early in the twentieth century, the community of astronomers had already settled on the idea that gravity and inertia rule the heavens. Having constructed a simple and secure vision of the cosmos, they were not eager to entertain a more exotic force except as an inferior consideration, a footnote to a mathematically elegant “big picture” of the cosmos. The enigma is highlighted by the top picture above: 1500 light-years from Earth lies “Herbig Haro 111”, displaying a jet 12 light-years long with charged particles accelerated to speeds approaching 500 kilometers per second. The finely filamentary and knotted jet spans three times the distance from the Sun to our nearest star. The authors of a Hubble Telescope webpage discussing stellar jets have unintentionally highlighted the present strains on the astronomers’ vision. They seek to account for the “collimated” or narrowly confined jets in terms of a “nozzle” located on one end—an explanation defying all that science has learned about gases in a vacuum. The strains are inescapable. We see them, for example, when the authors of the Hubble page acknowledge that magnetic fields “might focus the gas into narrow beams”. To this possibility, they respond, “there is as yet no direct observational evidence that magnetic fields are important”. Eventually most astronomers have come to acknowledge the ubiquitous presence of magnetic fields in space. But in the face of this acknowledgement, how could they preserve their foundational principle, which implies that electricity does not “do anything” in the macrocosm? For a time astronomers thought they had an ally in the brilliant electrical engineer, Hannes Alfvén, to whom all of modern physics is indebted for new insights on the role of electric and magnetic fields in plasma. Alfvén’s contributions were based on pioneering laboratory research. In his early papers, he spoke of magnetic fields being “frozen” into neutral plasma. To this notion astronomers were readily attracted! It meant that plasma in space could have been magnetized in primordial times or in early stages of stellar and galactic evolution, all under the control of higher-order gravitational dynamics. Every energetic event could still be explained in terms of disconnected islands of matter moving solely within the grip of gravity. Under Alfvén’s early assumption, astrophysicists began to study magnetized plasma without having to seek out larger electric currents. They came to view electric currents as localized and temporary phenomena needed just long enough to create a magnetic field, to magnetize plasma, the “perfect conductor”. Today, Alfvén’s concept of magnetic fields “frozen-into plasma” underpins most mainstream interpretations of magnetism in space. The approach enables astronomers to look past the causative electric currents as if they are no longer relevant. The study of magnetized plasma is now called “magnetohydrodynamics”, and Alfvén is acknowledged as the founder of the study. In 1970 he received the Nobel Prize for his “fundamental discoveries in magnetohydrodynamics”. The critical turn in this story, the part almost never told within the community of astronomers, is that Alfvén came to realize he had been mistaken. And he used the occasion of his acceptance speech for the Nobel Prize to plead with scientists to ignore his earlier work. Magnetic fields, he said, are only part of the story. The electric currents that create magnetic fields must not be overlooked, and contemporary attempts to model space plasma in the absence of electric currents will set astronomy and astrophysics on a course toward crisis, he said. Alfvén stated emphatically that plasma behavior is too “complicated and awkward” for the tastes of the mathematicians. It is a field “not at all suited for mathematically elegant theories”. It requires hands-on attention to plasma dynamics in the laboratory. Sadly, he observed, the plasma universe became “the playground of theoreticians who have never seen a plasma in a laboratory. Many of them still believe in formulae which we know from laboratory experiments to be wrong”. Again and again Alfvén reiterated the point: the underlying assumptions of cosmologists today “are developed with the most sophisticated mathematical methods and it is only the plasma itself which does not ‘understand’ how beautiful the theories are and absolutely refuses to obey them”. The theoretical crisis only deepens as astronomers view the universe with higher-powered telescopes and with instruments that “see” the entire electromagnetic spectrum. Wherever they look, astronomers encounter the effects of magnetic fields—a wild card that will inevitably shatter the foundational assumptions of “standard” astronomy: Space plasma cannot have a magnetic field permanently "frozen in" to it. In a rarefied plasma environment, electric currents are required to sustain a magnetic field. Herbig Haro objects—and innumerable other structures in space—thus stand as a fundamental challenge to the astronomers’ electrically sterile universe. Decades ago, Alfvén showed that stars have an electrical circuit involving an equatorial current sheet and polar current streams. He noted that electromagnetic energy could be stored in a star's equatorial current sheet until some critical juncture when that energy is switched into a polar discharge. The resulting jet would be energized by a particle-accelerating "double layer", the wall of an insulating plasma sheath, across which there is a strong electric field. In the presence of such an electric field, the gravity of a star would give way to a force incomparably more powerful than gravity, accelerating matter away from the star. (A similar mechanism is now being investigated for advanced plasma rocket engines). Decades of laboratory experiments have shown that a toroidal magnetic field, created by a polar plasma discharge, confines the discharge to a narrow jet. In the vacuum of space, a magnetic field will prevent the hot gases of a discharge from rapidly dispersing and cooling like a wisp of steam. In the same way, plasma experiments have shown that it is electrical energy that creates and lights the bright knots and glowing filaments along the path of the discharge. So the electrical theorists can only scratch their heads when they see exclamations of surprise and bafflement over the “mysteries” of interstellar jets. The new discoveries simply confirm the findings of Alfvén and his colleagues: Experiments in the plasma laboratory are scalable to cosmic dimensions. It is the common sense of the electrical engineer, not elegant equations, that exposes the obvious in Herbig-Haro objects. An axial electric current, confined by a current-induced toroidal magnetic field, is flowing along the entire length of the jet. Only an electric field can accelerate charged particles across interstellar space. There is no “nozzle” on one end accomplishing the inconceivable. The jet is not defying good science, but reinforcing it. And if the pictures speak more loudly than today’s gravitational dogma, this is because interstellar space is alive with electric currents.